On BJ21.com recently, an article by my late friend MathProf was featured, entitled The Math of Tipping. honest dealer dispenses no favors in return for a toke. will not change the expected value of the next hand. what I give up in tokes. Dealers are overpaid. At minimum wage, adding the excessive tipping most ploppies engage in, their actual wage is around $12 per hour at the worst dumps (about $25,000 per year), and around $35 to $40 per hour at the carpet joints (about $75,000 to $85,000 per year). The high-end dealers make more than most police officers, nurses, or teachers make. Yet the dealer has a job that requires no formal education, no real skills, and only a few weeks of training. Many dealers don't even bother to learn to speak English, and many have minimal or NO "people skills." Yet people line up to take dealer jobs. Why? Because dealing is a better job than they are able to find elsewhere. There are a few exceptions, particularly bright young people who may be dealers for a short time while going to school or getting ready to embark on other careers, but need immediate employment. Granted, it's an unpleasant environment and lousy work, frequently dealing with disrespectful, hostile, and often drunken members of the public. I doubt if I, personally, would last a single day as a dealer. But that doesn't take away the fact that there is no dealer shortage anywhere that I'm aware of. So the job must not be that bad for those willing to do it. I tip generously those who provide a service to me, in positions where tipping is normal and customary, such as in restaurants and cocktail waitresses in casinos. But I don't tip a plumber, electrician, or auto mechanic. They certainly provide a service -- why don't they deserve tips, but a dealer does? In thousands of hours in casinos, I can think of only a handful of times when dealers went out of their way to provide me with any quantifiable service that should earn them tips -- better penetration, not loudly shouting "checks play," dealing as quickly as they were able, etc. Most dealers are on autopilot; normal working people trying to get through their routine workday. Few know anything about advantage play, and fewer still would recognize the offering of a tip as a subtle request for the better playing conditions that are within their power to dispense. For the ploppy, who is in the casino to be "entertained," and is willing to lose his or her money for the dubious "entertainment value" they receive, the people skills of the dealer may add value to their entertainment experience. Such a person should, and almost always does, tip the dealer. They are receiving a service from the dealer, in that their time at the table is more pleasant. The ploppy has negative EV and is eventually going to lose all his or her money. I'd rather the dealer gets some of that money than the casino owner. 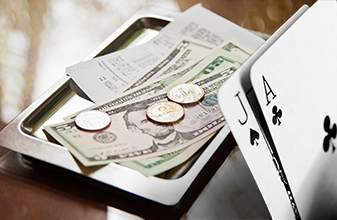 For an advantage player who is in a casino simply to make money, tipping is a waste, except for the instances that it provides cover and/or longevity. I don't care if the dealer is pleasant or not. In fact, my favorite type of dealer is one who deals quickly and never says a word -- a deaf mute would be the perfect dealer. No useless, idle chit-chat, no nosy questions. Just the cards flying as fast as possible, to maximize my hands-per-hour. Other than at the times when tipping buys cover and/or longevity, it's just another business expense that can usually be cut out. Would you pay a higher price for gasoline because the gas station cashier is pleasant? Would you pay a higher price than you have to for any commodity product? Needlessly giving away a portion of your profit is the same thing. It directly affects your bottom line. I don't see the point in deliberately lowering profit for no good reason. the reason has to be one of social acceptability and custom. no job security, and work for tips. Don and I have agreed to disagree on this topic. For me, it’s still: Don’t tip at all, except in special circumstances. Im a dealer in the UK and I don't know what its like in the States for Croupiers but I can tell you that dealers are on close to minimum wage for at least the first few years and our tips really make difference to our income. It's a high pressure job that requires a lot of skill, and there are many with great customer service that can make a game a really entertaining one. Your blackjack dealer isn't only dealing blackjack. It's also a tough job to have any kind of normal life around. And I work with people from all over the place who speak great English as well as a couple other languages. I've met rubbish dealers who didn't even make eye contact. I don't tip anyone who isn't adding anything personal. I don't tip boring taxi drivers either. But say you've got some young European trainee dealer who's miles from home and gave it their all to train for this job, learn English and move abroad, who just had their head smashed on roulette, has to deal with rude and nasty customers... I could go on... and they're providing a good service - why not tip them a little? After all, if you tip well, the managers and pit bosses are going to like you more and be less suspicious. Anyone who tips well in my casino is given a warm welcome by all of the staff and looked after well. If you're gonna be some quiet blackjack gremlin playing in ponies everybody will be watching your game. And they'll want you to leave.